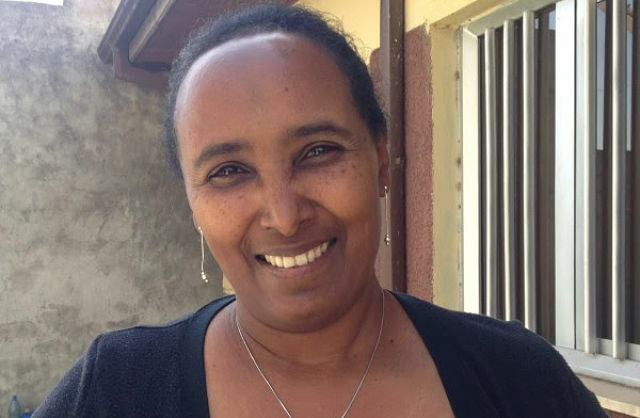 New York (TADIAS) — Berhane Daba, President and Founder of Ethiopian Women with Disabilities National Association, has been named winner of the 2015 Harris Wofford Global Citizen Award, a prestigious annual prize given by the National Peace Corps Association. Daba will be honored in Berkeley, California this weekend and then will meet with national disability rights activists and Congress members next week on Capitol Hill in Washington, D.C. It was during this period that Daba would meet Peace Corps Volunteer and nurse Mary Myers-Bruckenstein. Seeing Daba as a unique and valuable person with potential, Myers-Bruckenstein decided to take her into her home. Daba then entered an environment where she had an opportunity to heal and to attend school. Daba viewed gaining an education as her greatest opportunity to live an independent lifestyle. She refused to accept limits placed on her by society, and it is through this process of bettering herself and overcoming prejudice that she found her calling—to assist others and to champion equal access and opportunity for people with disability. Since founding the Ethiopian Women with Disabilities National Association in 1995, Daba has worked to expand the organization’s member base from its original eight members to over 2,100 today. Beyond providing technical and vocational training, EWDNA offers counseling and guidance services to further empower members to confidently enter the workforce. EWDNA uses a sustainable business model to fund its programming, operating a bakery where members can work, and thus promoting the organization’s goal of socio-economic empowerment for disabled women. Daba has become an international leader on behalf of her cause, and has travelled to Rwanda, Kenya, Zambia, Uganda, and South Africa for meetings and conferences. This summer she plans to attend leadership training in Italy sponsored by the International Labour Organization. The NPCA will present Berhane Daba with the 2015 Harris Wofford Global Citizen Award on Saturday, June 6 at Peace Corps Connect – Berkeley. Daba will be in Washington, DC the following week meeting with disability rights activists and members of Congress. The Wofford Award is named in honor of Harris Wofford, former U.S. Senator and special assistant to U.S. President John F. Kennedy, who was instrumental in the formation of the Peace Corps. Former Nigerian Vice President Atiku Abubakar, successful businessman and philanthropist, endowed the Award. He is also the Award’s first recipient, presented to him in September 2011 at the NPCA “Promise of the Peace Corps Gala” celebrating Peace Corps’ 50th anniversary. You can learn more about The Harris Wofford Award at Peacecorpsconnect.org.